A camouflage paint job on a Vehicles really sets a bike apart from the crowd. This type of paint job can be in honor of time served in the military, a gift to friend in the army or just a great way to spice up your Vehicles. 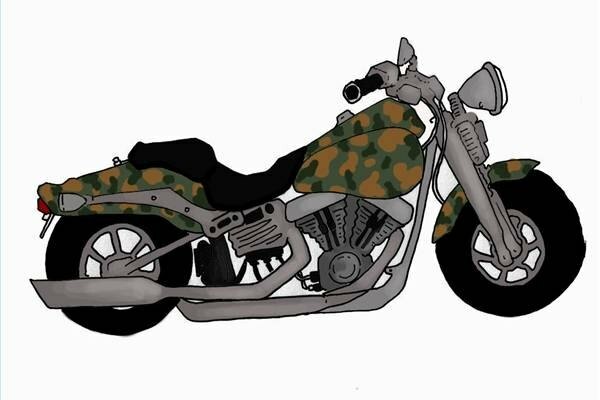 Creating camo on your bike is not as difficult as it may seem. This is especially true if you use hand painting techniques. While this may not look as slick as an airbrush paint job, you will find you have a lot more control over the paint. Another advantage is that this style of painting costs less and is quicker and easier to clean up. Tape trash bags around all the chrome and any part of the motorcycle that you don't want paint on. Sand the areas you wish to paint. You don't need to remove all the paint, simply scuff it up enough so that you can get a new coat of paint to stick. Spray the sections you wish to paint with paint primer. Let this dry overnight. Spray the bike with forest green enamel auto paint. Let the forest green paint dry for 2 hours. Paint small ovals of light brown enamel on top of the forest green. Space these at least 2 to 3 inches apart from one another. Make them look like camouflage patterns by adding rounded half circles and blob-like shapes along the side of the ovals. Let this dry for 2 hours. Mix 2 cups of navy blue enamel with 2 cups of forest green to create a very dark green. Add this in a pattern similar to the light brown enamel. However, these camouflage shapes should be about half as small as the light brown shapes. Let the paint dry for 2 hours. Spray all the areas painted with enamel sealer to ensure that the paint stays on. Let this dry overnight, then carefully remove the tape and garbage bags. You can use a solvent like "Goo Gone" on the chrome is the tape leaves behind any residue. Clean the plastic surface of your ATV using a mild soap and hot water. Allow the ATV to air dry. Sand the plastic surface using a 180-grit sandpaper. This helps remove old paint and rust. Scrub ATV plastic using a scuff pad and Scuff Magic solution. Give your ATV another round of sanding with 180-grit sand paper in order to remove any left over sports of paint, rust, or crust. Clean the sanded plastic using a plastic cleaner. Spray the plastic cleaner on the plastic of your ATV and allow the cleaner to sit for about one minute. Wipe the cleaner off of the plastic using a clean towel to remove dust and oil from the plastic. Apply a coat of Plastic Magic to the surface of the ATV. Allow the first coat to dry completely and apply a second coat. Apply a paint primer to the entire surface of the ATV. Allow the primer to fully catalyze with the ATV surface. Draw the camouflage pattern on the ATV surface using a light pencil. Draw any desired shapes or sizes. Camouflage print can be made of large or small shapes. Typically, most camouflage print features a variety of rounded shapes. Open the can of the lightest paint color and apply the paint to the ATV using a medium sized paint brush. Apply paint to about one third of the shapes you drew in Step 7. Don't worry too much about painting perfectly or choosing the right shapes. Camouflage should look slightly random. Allow the paint to dry and add a second coat. Apply the medium-colored camouflage paint to the ATV. Color in about half of the remaining shapes. Don't worry if you paint over some of the edges of the lighter colored camouflage. Allow this paint to dry and add a second coat. Apply the darkest color of camouflage paint and fill in all of the remaining shapes. Make sure that there are no spots left where the primer shows through. Add a second coat of paint after the first coat of paint dries. Apply two coats of clear paint to the plastic once the camouflage dries completely. Mask off parts of the car that will not be painted. Tape paper over the windshield, rear window and other windows and tires. Tape over headlights, tail lights, the grill and other trim pieces. Sand the entire car to prepare for paint. For sanding the roof, open the car doors and stand on the door sills to reach the center. Use a ladder to spray the top of the car, making sure the ladder doesn't touch the sides of the car. Spray the tops of the roof, hood and trunk first and then move onto the remaining parts of the car. Spray two coats of medium-gray paint on the entire car before using any stencils. This should cover all of the primer and give you a base coat to start with. Make sure all of the primered surface is covered. Spray black and brown paint on the lower half of the car, holding the can at least 10 to 12 inches from the surface to get a soft effect. Spray the paint in sections about 1 foot apart so that the grass stencils placed on top of this have a little background color other than the gray base coat. Place the thin stencils against the car and paint them black. This stencil makes short black lines for a background under the grass stencils. Use these stencils starting from the bottom of the car to over halfway up the side of the car. This pattern will extend up further than the grass stencils. Using the grass stencil, start at the bottom of the car with tan-colored paint. Hold the stencil about an inch from the surface of the car so that when the paint is sprayed, there are no hard lines defining the grass. Use this technique every 3 feet on the car from the bottom to the halfway point. Start at the front of the car and work to the rear bumper. Spray a light-brown color using the grass stencil again, but this time place the stencil directly on the car to get a sharp, defined image. Use this stencil in the same area as the last step, placing it slightly to the side of the last pattern, but still partially covering the other color. Apply two or three coats of clear on the car and allow it to dry. This protects the paint and helps the camo last longer without fading or peeling.